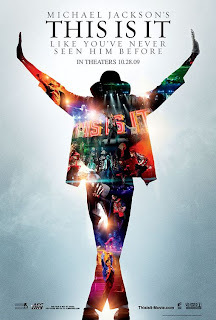 The official movie poster for “Michael Jackson’s This Is It” has been released. The movie offers Jackson fans and music lovers worldwide a rare, behind-the-scenes look at The King Of Pop as he developed, created and rehearsed for his sold-out shows that were set to start this past July in London’s O2 Arena. Tickets for the movie will go on sale Sunday, September 27th. It will play in theaters for two weeks starting October 28, 2009.